The Outstanding Student’s Banquet in May 2017. The newly honored students will have their own banquet in November. Photo courtesy of Allie Cook’s Facebook. Last semester’s Top 15 outstanding students was expanded to 26 after the Outstanding Student Recognition Program, run by the Office of Student Affairs and the Alumni Association, discovered a scoring error in applications. Meg Haggerty, associate director of student affairs, and Jennie Jones, associate director of alumni & parent programs, run the program together in coordination with Butler’s IT department. They discovered the issue during the summer, after the April banquet honoring the original Top 15 students. In preparation for the upcoming school year’s applications they realized that “round two calculations didn’t score the way that we intended,” Jones said. The Outstanding Students Program has operated on campus for more than 50 years. Each year, around 600 students are nominated by faculty or other students, allowing them to apply to be a Top 100 outstanding student, Jones said. Around 300 choose to go through the application process. Once the Top 100 are chosen, they have the opportunity to submit letters of recommendation and be considered for the highest honor: the Top 15 outstanding students. In addition to major and GPA, students can include in their applications any on-campus involvement and leadership, service opportunities and a short reflection. To apply for the Top 15, students have the option to include up to three letters of recommendation in addition to their original application, Haggerty said. Haggerty and Jones reach out to the deans of each college, associate deans, student affairs, the athletic department, academic affairs and the diversity programs office and ask each to name a few judges. The judges are assigned to a section of the application and enter a score into the online system, Haggerty said. The error they discovered was in the formula the online system used to calculate the Top 15 students. After fixing the error, the office notified the 11 students who should have been included in the original Top 15. “The way that we intended for the applications to be scored, they should have been recognized in the Top 15 and weren’t,” Jones said. Haggerty and Jones reached out to the newly named 11 students personally, making sure to contact them in person or over the phone, as several of the students graduated in May 2017. Only one student has not followed up with the program to acknowledge that they received the news, Haggerty said. Music and psychology major Emily Farrer, who graduated in May 2017, was one of the 11 newly named honorees. She said Haggerty explained the online system error that lead to an added number of honorees. Fifth-year pharmacy student Chandler Howell was also newly included into the Top 15 and shares Farrer’s sentiments. Music performance major Heather Wright, also one of the new 11, was unaware of just how many students were in her same position, and said she was under the impression that only five students were being added. She was contacted by the program and received the news from Jones at the beginning of the semester. Wright has already been applying for dental schools with the Top 100 honor on her resume, not knowing that she was included in the Top 15. She hesitates to tell schools of her newest honor because “if they go and look it up, they are going to be confused,” Wright said. All academic leadership, judges and the previous honorees, those who received the Top 15 honor at the April banquet, were made aware of the issue, Haggerty said. However, those honored in April only received an email from the program rather than a phone call. Several of them graduated and no longer regularly check their Butler email addresses. Two such students, Gwen Kozack and Sarah Clary were unaware of the situation until they specifically searched for correspondence from the program. Despite the error omitting 11 students, Haggerty and Jones stand behind the original top 15 students who were named in April 2017 and are expanding the honor to include all 26 students. The scoring method the Outstanding Student Recognition Program uses has been in place for over 10 years and it “is something that we have sort of inherited,” Jones said. The program takes this incident as an opportunity to examine how it will operate in the future. Because Haggerty and Jones looked at data from past years to be sure this issue had not occurred previously, they suspect the error occurred when they overhauled the online system to remove gender. The 2016-2017 school year was the first year that the Outstanding Students Program used a gender-neutral Top 15. Previously, the highest honors were the Top 10 Men and the Top 10 Women. Haggerty and Jones have fixed the issue with IT and have added a secondary reporting function to ensure a similar issue will not arise in the future, Jones said. 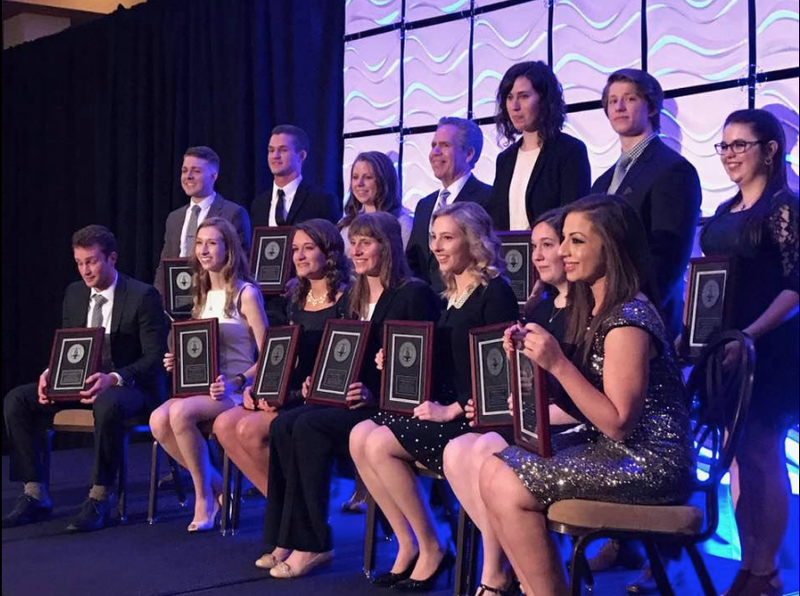 A complimentary banquet for the newly named Top 15 students will be held in November.